Please, attend all functions of the event. ii. Thursday practice is not mandatory; however, if you cannot be present, please tell Tonya asap so every effort can be made to balance leads & follows for optimal learning. iii. If you cannot be at Thursday practice and you want to perform on Wednesday, You must text, email, call Tonya by 9:15p Thursday evening to receive an assigned partner. 1. If you do not respond and still want to participate in that week’s performances, it is up to you to find a partner and you must advise Tonya of your intent to participate by Monday evening, so she can print out the appropriate judges’ sheets. iv. The official Thursday choreography video is published by Friday evening on facebook and emailed to you. 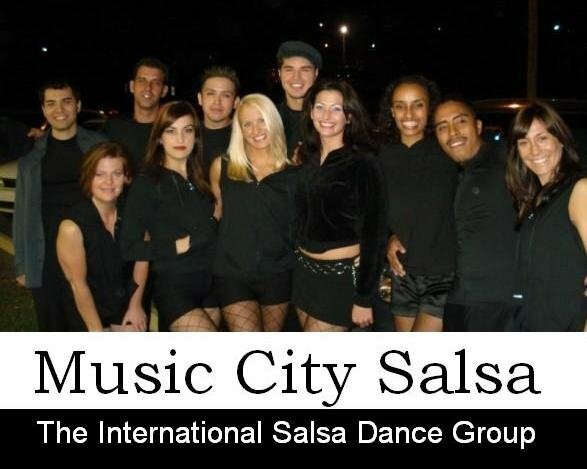 Videos are published on musiccitysalsa.net. b. Wednesday performances from 8:35-8:45p at play- 1519 Church St.
i. If you must miss one Wednesday performance, this may be counted toward the dropping of your lowest score. More than one missed Wednesday performance is considered grounds for removal from all further participation in the contest. ii. If you are not able to attend and perform on Wednesday, You may enter your video performance by recording it at Tonya’s house before or on that Wednesday, so the judges can score your video performance along with the other contestants’ performances. iii. Official Wednesday performance videos are published simultaneously, in an effort to give everyone the same amount of time to promote for points. i. If it becomes apparent that Tonya’s house will not fully accommodate all folks to practice on Saturday, then efforts will be made to find a larger venue. In that case, the Saturday times may vary according to the venue’s availability. ii. Saturday practice is for everyone. Choreographers may and sometimes attend. Review of the entire choreography begins promptly at start time. d. Awards Night from 7-9:30p on Wednesday, April 30th at Play- 1519 Church St.
i. All contestants are recognized on Awards Night. ii. Choreographers & more Performances pay tribute to your efforts. iii. The reigning champions pass on their crowns; i.e., if you are named Nashville’s Top Performer 2014 or are the Runner-up, please plan to attend the 2015 awards ceremony. a. Your weekly $15 payment is due at the beginning of each Thursday choreography session. Payment-in-full may be made at any time. The total cost is $90. Until all venue & choreographer costs are paid, Checks are made directly to either dance world or the choreographer, so please ask Tonya before addressing your check. b. Exceptions-- choreographers & passed winners/ runners-up are permitted to attend all functions free of charge, as well as their chosen partners. i. Past contestants may attend any choreography session for free, unless they are competing. ii. Alternates chosen by Tonya or a contestant to assist on Thursdays, Saturdays, and Wednesdays are free of charge. a. You are randomly selected and then later assigned a partner each week, with the intention to have all contestants dance at least once with each other. Understand that every effort is made to make the contest fair and enjoyable for everyone. i. Size compatibility is considered for certain dances that require more attention to that. ii. Tonya reserves the right to assign partners. b. Alternates- an alternate may be assigned to you by Tonya, in an effort to provide everyone with a partner for both Thursday night practice and for Wednesday performances. i. You may choose your own partner if that person attends the Thursday practice and that same person performs with you the following Wednesday. ii. If you perform as an alternate or partner for more than one Wednesday performance, only your highest score will be used. a. You may alter two (2) eight-counts of the original choreography, unless otherwise stated at the Thursday session. Altered eight-counts after the two will be a 5 point deduction to your individual score & a 2.5 deduction to your couple score. b. Lifts, dips & tricks are permitted. c. Sergio’s Second Chance— you may restart your performance one time. Each restart after the second= 5 individual & 2.5 couple points deducted from your overall weekly score for that dance. d. You may extend the beginning and ending of each performance for no longer than 30 seconds in total. Please, advise Tonya of this type of alteration, so she can manage the music and begin/end per your preference. i. You are evaluated weekly by six judges on your technical & artistic demonstration. The judges sheets are centered around showmanship, togetherness, transitions, style execution, synchronization, style specialties, choreography, routine difficulty, overall execution, overall impression. ii. You receive weekly two scores for individual lead/follow and two scores for couple. Individual and couples scores are averaged separately. iii. Every effort is made to select judges who are either teachers, performers, former contestants or otherwise having sound knowledge of dance and the style being performed. Judges are selected at random. iv. Judges’ comments are shared with the contestants each week in an effort to better your dance. v. Judges’ sheets are labeled by identifying numbers contestants (leads) wear each week pinned to their backs. vi. All judges comments are kept anonymous. vii. Judges are not bound by anything other than their own opinions. 1. Youtube views are counted at 10p on Tuesday night. 2. The highest # of views is considered 100% of the 12.5% and subsequent lower scores are calculated as a % of that highest score. Example: The Men's highest YT views is 258 (258=1). Danny achieved 134 views. Danny's score is 134/258=.519379. 1. Although a comment & a like are counted separately, effort is made to make sure that the act of commenting is counted only once per person commenting. 2. All shared links count separately and are researched for more likes & comments to be counted. 3. The highest # of combined likes, shares and comments is considered 100% of the 12.5% and subsequent lower scores are calculated as a % of that highest score. Example: The Ladies' highest FB score is 138 (138=1). Susie achieved 99. Susie's score is 99/138=.717391. 4. Facebook likes & comments are counted at 10p on Tuesday night. c. Scores are published online at musiccitysalsa.net. d. Your lowest score is dropped at the end of the contest. a. There is no guaranty as to what the winners receive. b. Past winners have received: certificates commemorating their achievements, private lessons, party & group class passes, workshops, boot-camps, national salsa/bachata/kizomba congress passes, gift certificates, groupons for dinner & more! a. Tonya reserves the right to alter, change, add, delete, etc. at any time. b. Tonya commits to inform all parties of any revisions as soon as possible. Suggestions to make your experience optimal!! You are encouraged to dress up, role-play, show-off, act, etc. in your performances. Not always is the best technical performance the one that gets the highest score. You are highly encouraged to attend the Thursday session. Since most folks need time to “sleep on it,” that extra day gives them a leg up. Plus, the choreography videos don't post until Friday evening. This is your experience! Your adventure! Your opportunity to be part of something bigger, something fun, and something you will remember for the rest of your life! The next six weeks will challenge you! You are invited and encouraged to push yourself out of your comfort zone! You will get tired, both physically and mentally. But then again, that is when you grow! You will be a different, better dancer! So, go for it! It will be over before you know it! Overall, Tonya is here for you! Thank you for giving Tonya this opportunity to share her dance passion! Thank you for being a leader and sharing your growth with our dance community!